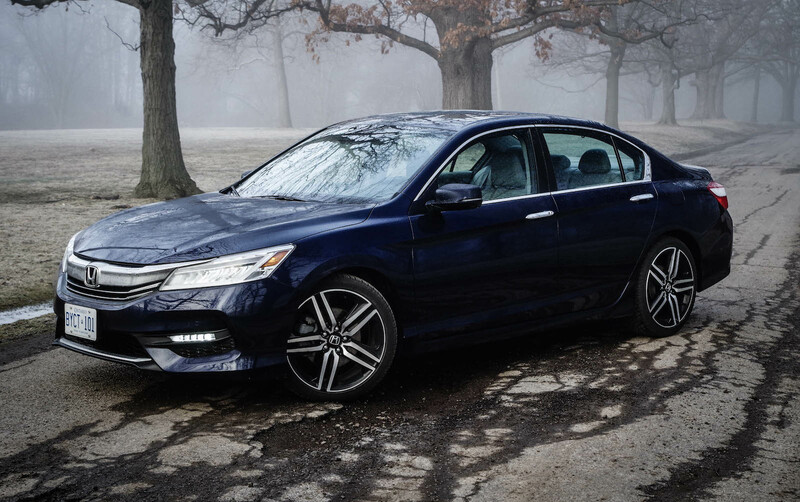 The Honda Accord has long been the champion sedan for the masses. 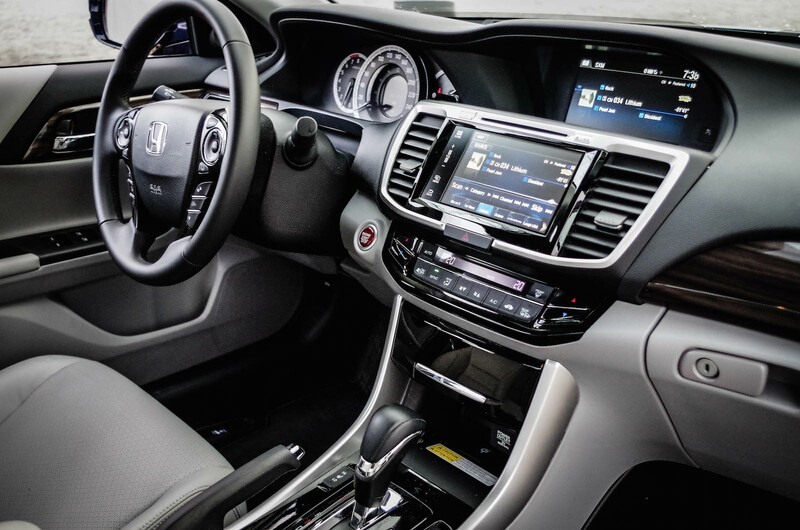 Despite the current trend toward crossovers, the Accord has held its own and remains a very popular model. It has long been said that we should never judge a book by its cover, and between the models years of 1993-1997, the Accord survived in large part because of this thinking. However in my eyes, the Accord was softened to the point of boredom. In 1998 the styling started to improve but by that time, my wandering eye had moved on. How things have changed. For 2016, Honda engineers have made a large effort to increase the popularity of the Accord by refreshing a few crucial areas. The most noticeable revision is the new look but they have also improved the ride, handling, and even – much to my chagrin – managed to make the CVT bearable. Immediately I noticed the locked in and focused front end like that of a predator eyeing its prey. The LED lighting used on the Touring model looks downright sinister on a foggy road, but the looks go beyond a facelift. 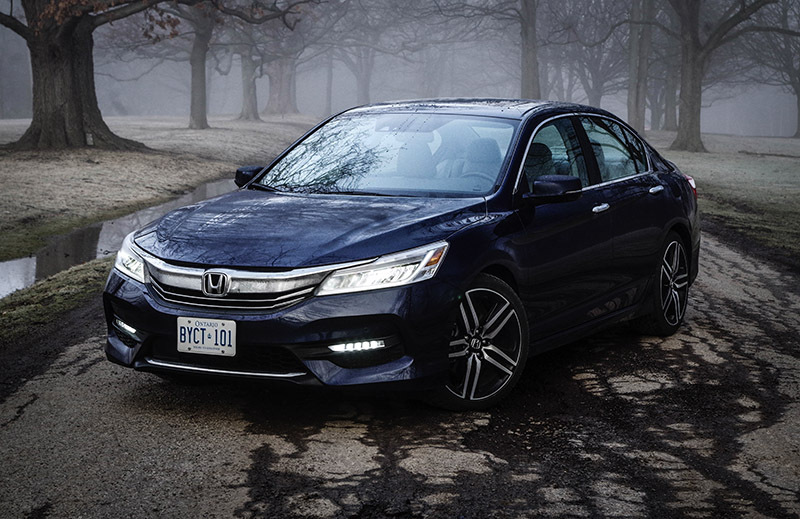 The stance appears squatter, broader and sportier; the Accord has never been so attractive. The design team has even spent time reworking the backside to good effect; an area which, on many newer cars, tends to look thrown together at the last minute, almost forgotten about. The Touring model comes equipped with great looking 5-spoke 19-inch wheels that sport 235/40R19 tires. It also has a trunk lid spoiler that doesn’t look vulgar in proportion; this is a sedan after all, not a rally car. Aesthetically speaking, I think the 2016 Accord is a complete success. Turning our attention inwards, we find a very inviting cockpit. The grey leather against the black and wood grain dash and door trims looks fantastic. It gives an upscale vibe that would not look out of place in a luxury car. 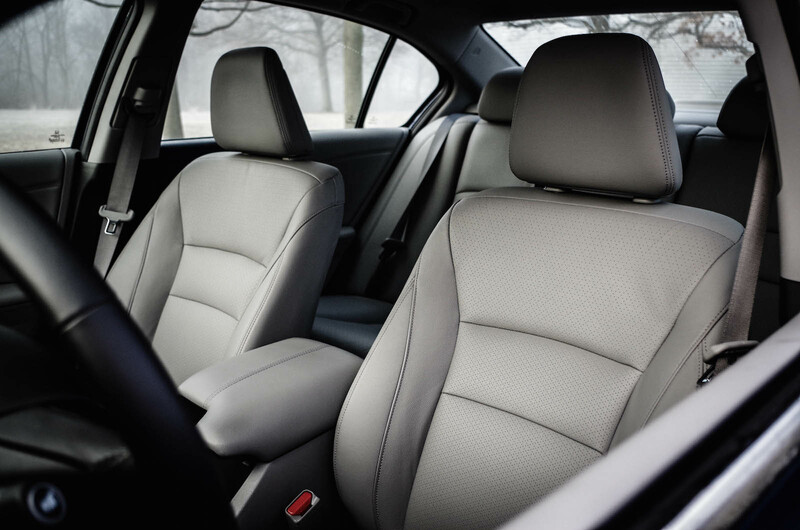 The seats offer a comfortable and contained feeling while you drive even the curviest of roads. To keep the price from sky-rocketing, the accountants have stipulated the use of a fair bit of plastic, but everything you will come into contact with has a nice well-built feel. 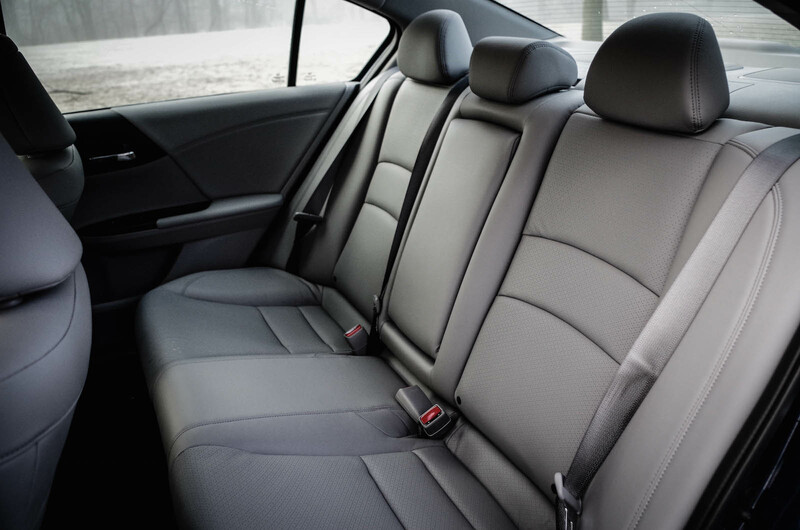 There is ample headroom and legroom room for all passengers and in my tester, heated seats for four of the five passengers. The trunk is large, deep and can handle up to 379 L of cargo. About the only things that were missing were ventilated front seats and a heated steering wheel. What really grabbed my attention as I poured over the features and options list for the various models was the amount of equipment that comes in the base model. 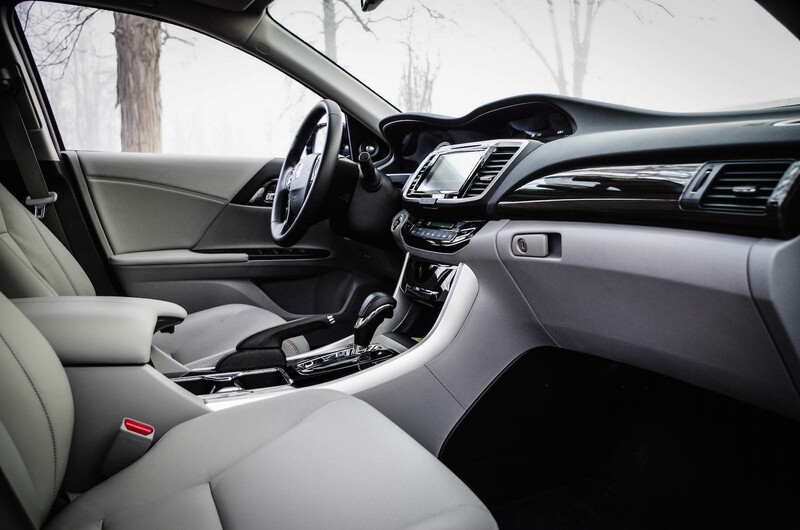 A few stand outs were LED daytime running lights, dual-zone climate control, Bluetooth, multi-angle rear view camera, remote start on all models with the CVT, and active noise cancellation. The list goes on and on. Needless to say, whatever model you choose you are getting generous amounts of equipment for your hard earned dollar. 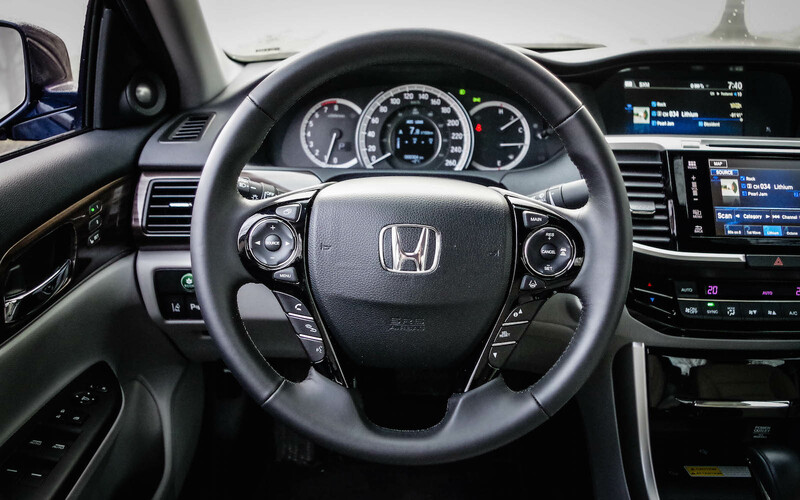 Honda has given into some criticism when it comes to the controls. Specifically, the complaint is the absolute lack of buttons or knobs. While the entertainment and navigation remains button-less (with exception to the steering wheel buttons), the HVAC has actual hard buttons. You can change the temperature or redirect airflow without taking your eyes off the road, thereby keeping the driver free of distraction. I liked the two screen setup of the infotainment system because it allows you to keep your map open while simultaneously displaying your music on the upper screen. That means the driver can follow the map regardless of what their passenger is doing to the stereo. The gauge cluster is also well thought out; it is clear and easy to read and has the look of an expensive time piece. 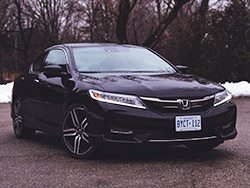 There are two engine choices for the Accord, both are naturally aspirated and make soothing sounds. The optional 3.5-litre V6 will make 278 horsepower and 251 lb-ft of torque. It will also delight the driver with more performance and a noticeably larger fuel bill. The 2.4-litre 4-cylinder I tried out is a very responsive and efficient unit. I saw 7.8 L/100km of fuel consumption over the course of my time with the car, which is slightly less than the advertised estimate. The 4-pot engine runs smoothly and provides decent power. It complements the serene nature of the Touring model perfectly, but there is one fly in the ointment. At idle the whole car vibrates in varying degrees of harshness. I am not entirely sure what is to blame, but I suspect there is an issue balancing the engine with the CVT. This is not the first vehicle to have this condition; the 2015 CR-V also received some complaints of vibration. My advice is to drive one yourself and decide, because not everyone notices it and it will in no way pose any danger to you or the vehicle. I will not harp on the CVT because Honda has given us the choice to option out and select a real 6-speed manual transmission on any model. 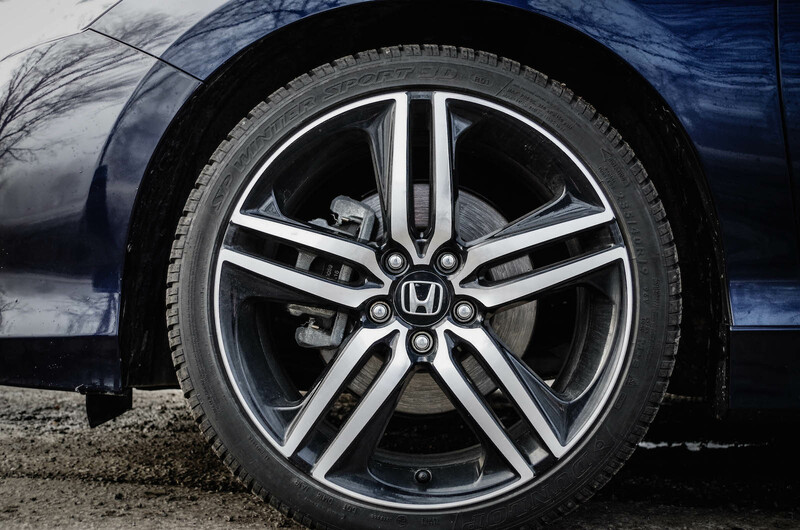 Honda manuals are among the best available with crisp gear changes and faultless clutches. The CVT I drove was an acceptable version of the genre. It featured a sport mode that livened things up but unfortunately did not feature a manual shift method as most do. 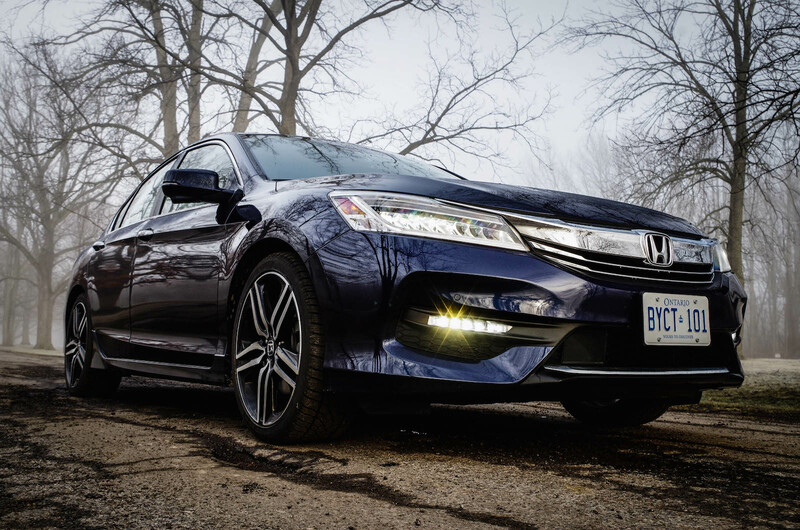 The new Accord has received some suspension and chassis upgrades as well as a finessing of the electric steering. 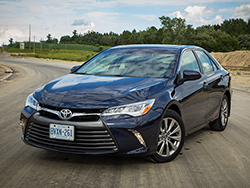 The car handles well, has an agreeable amount of feedback and when the scenery starts to blur, the car will respond in a predictably stable manner. This model will not win any races; rather it will deliver its passengers to their destination in comfort and style. If you select the manual transmission you will lose out on a few of the new technologies. Gone are the adaptive cruise and lane keeping assist. You will also forgo the convenience of remotely starting your car due to the possibility of the vehicle starting in gear and driving into something. These are small sacrifices and I for one am more than willing to take the loss for the cause of keeping the manual transmission alive. 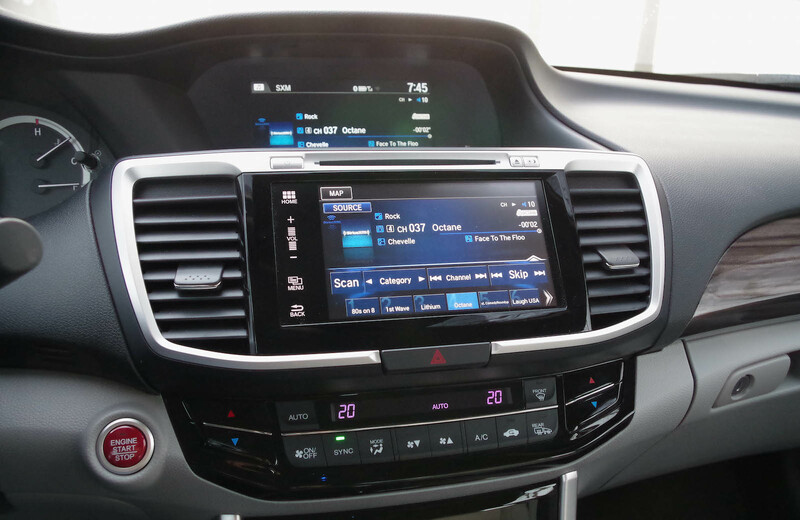 On the topic of technologies, all models come with Apple Carplay, Android Auto, Siri Eyes free capability, SMS text messaging, email function and satellite radio. 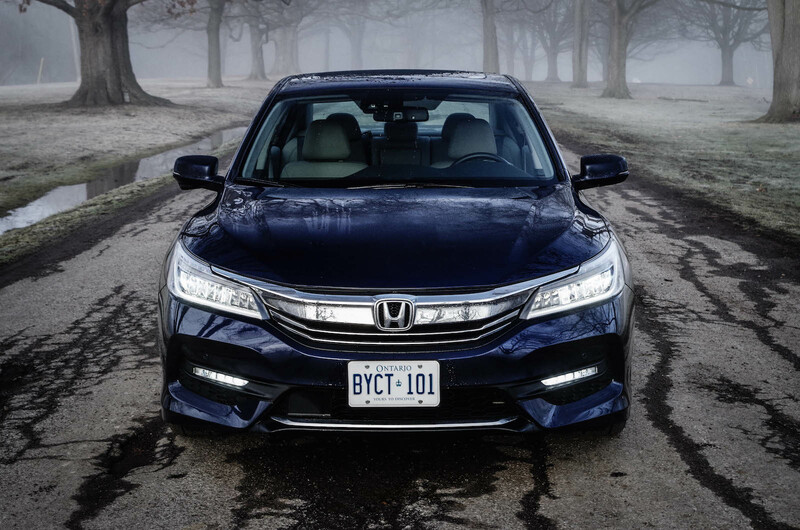 The Accord offers a lot more standard equipment but this just goes to show the level of value and the competitive packaging Honda has to offer. 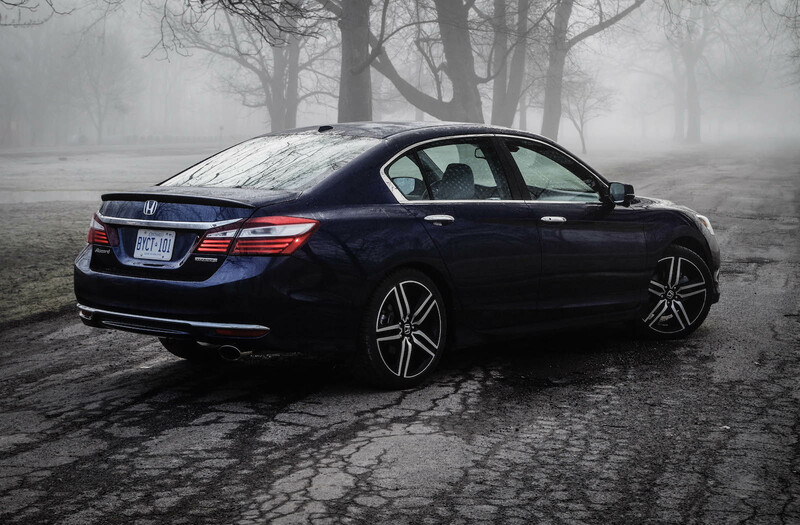 The Accord has always been of great value, offering fun-to-drive dynamics mixed with practicality. With new attention grabbing looks, more technology, and a refined chassis, the package is more compelling than ever. 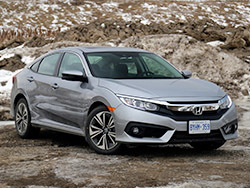 In a world rapidly filling with crossovers and SUVs, I am glad to see that Honda is continuing to champion their venerable sedan.